No matter how dry your skin, gentle cleansing at night is essential. 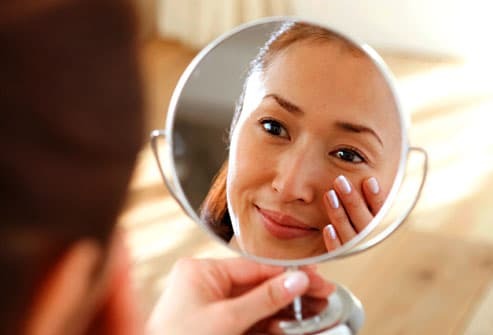 Makeup, sunscreen, bacteria, dead skin cells, dirt, and oil build up on your face during the day. They can work their way into your pores, causing inflammation. Wash gently without scrubbing to avoid irritating your skin. There's no need to wash again in the morning. Just rinse your face with water when you wake up. 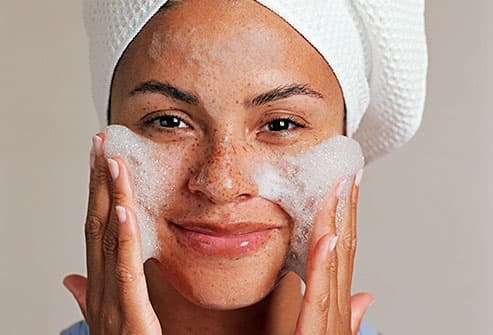 Harsh detergents in soap can strip away the natural moisturizing oils in your skin. 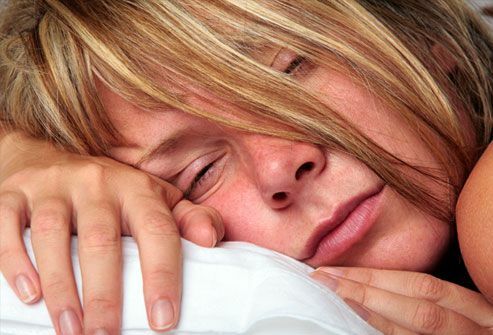 This can cause dryness, irritation, and inflammation. Soap-free cleansers work on your skin the same way as soap, but they're made of milder ingredients that don't deplete skin's oils. When you have dry skin, consider a gentle cleanser with added moisturizers. Your skin should feel soft and smooth after cleansing. If the cleanser makes your skin feel too dry, tight, or irritated, try a different one. 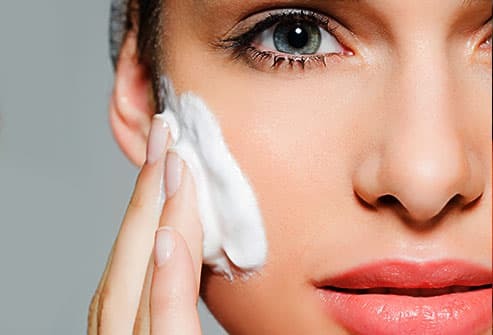 Avoid cleansers with salicylic or glycolic acid if you have dry skin. In addition to steering clear of harsh soaps, look for a cleanser that is free of fragrance, chemicals, or alcohol. Avoid antibacterial soaps, which can be drying. Ask your doctor whether you should use or avoid cleansers with exfoliants such as glycolic acid. Different types of cleansers may work for different people. Showers and baths add moisture to your skin, but they can also dry it out by removing the skin's natural oils. Hot water washes away oil faster than warm water. So use warm water when you cleanse your face and limit yourself to one short (five minutes) warm shower or bath a day. Close the bathroom door while you bathe to keep the room humid. Good news: If you have dry skin, you can forget about buying expensive daily face scrubs or scrubbers. In fact, you can forget scrubbing altogether. Rubbing and scrubbing can irritate your skin. Even the friction from washing with a sponge or washcloth can be irritating. The gentlest way to wash your face is also the most convenient: with your hands. You can also use a cotton round. Because you're cleansing with your hands, wash them first. Then dampen your face and hands with tepid water. Don't concern yourself with using enough water to work up a good lather. Mild cleansers may not lather much. Remember, your goal is to have skin that's smooth and supple, not "squeaky clean." More is not better when it comes to washing dry skin. Squeeze just a quarter-size dollop of cleanser into your palm and apply it evenly to your face. Then gently massage it into your skin with your fingertips, using circular motions. Be especially gentle around your eyes. Remember not to scrub -- even with your fingers. Don't ruin the perfect face cleansing by rubbing your skin dry. Rubbing can cause abrasion to your skin, which can lead to irritation and inflammation. Instead, rinse your face with tepid water, then pat it with a clean, dry cotton towel or washcloth. Don't dry it all the way -- the idea is to leave some moisture for your moisturizer to lock in. 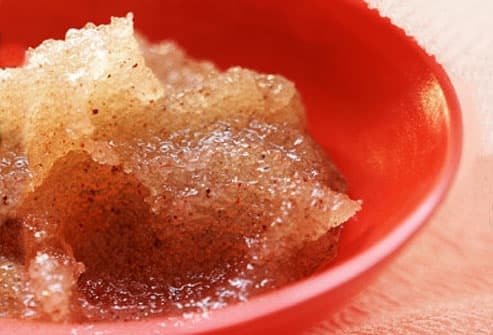 Exfoliation removes dead skin cells, allowing moisturizers to better penetrate your skin. But abrasive scrubs can damage dry skin, so exfoliate no more than once a week. Skip fruit scrubs, which can be harsh. Instead, try a scrub with rice enzymes or papain. These ingredients are gentle and a safe way to exfoliate. Exfoliating should never hurt. If it does, stop or try a gentler product. Moisturizers don't actually add moisture to the skin. They seal in existing water so it doesn't evaporate. Moisturize two or three times a day. Use the 3-minute rule: Apply moisturizer within 3 minutes of your nightly cleansing and morning rinse. 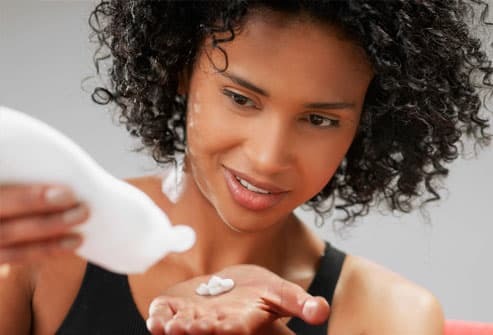 If you apply moisturizer again during the day, it's not necessary to rinse or cleanse first. 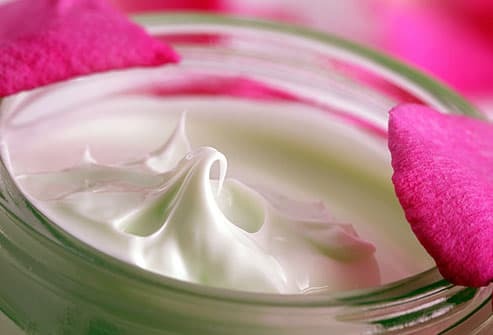 Creams and oils are more effective than lotions for dry skin. Humectants, such as glycerin and propylene glycol, draw water into the outer skin layer. Emollients -- like petrolatum, lanolin, mineral oil, and dimethicone -- trap water in the skin by forming a layer on its surface. Because occlusives like petroleum jelly act as a barrier and trap moisture, they are one of the best treatments for dry skin. You may want to avoid moisturizers that contain fragrances. And some ingredients, such as retinols, may be irritating to sensitive, dry skin. Test a facial moisturizer by first rubbing a tiny amount on your forearm for a few days. If it stings, burns, itches, or feels dry, don't use it. American Academy of Dermatology (AAD): "Moisturizing and Cleansing Key to Treating Atopic Dermatitis," "Dermatologists' Top 10 Tips for Relieving Dry Skin," "Eczema Bathing and Moisturizing Guidelines," "Research Uncovers New Treatment Options for Atopic Dermatitis," "Complementary Therapies: Applied to the Skin." Charles E. Crutchfield III, MD, dermatologist, Egan, Minn.; associate clinical professor of dermatology, University of Minnesota Medical School, Minneapolis. Amy Wechsler, MD, dermatologist and psychiatrist, New York; assistant clinical professor of dermatology, SUNY Downstate Medical College, Brooklyn; adjunct assistant clinical professor of psychiatry, Weill Cornell Medical College, New York; NY. FDA: "Alpha Hydroxy Acids in Cosmetics." American Osteopathic College of Dermatology: "Dry Skin (xerosis)." Kenet, B. How to Wash Your Face: America's Leading Dermatologist Reveals the Essential Secrets for Youthful, Radiant Skin, Simon & Schuster, 2008. Discovery Health: "How to Wash Your Face." Dermatology Nursing, October 1, 2006: "Moisturizers do more than just soften skin." Bikowski, J. Practical Dermatology, August 2009.